While the farm-to-table movement has grown in popularity since restaurants like Chez Panisse and The Herbfarm began promoting the benefits of locally grown foods, critics have been just as quick to point out the movement’s disadvantages. To celebrate the release of our new cookbook The Big Sky Bounty Cookbook: Local Ingredients and Rustic Recipes, we’ve put together the history of the movement, and the biggest arguments for and against eating locally grown foods. An offshoot of the hippie movement of the 1960s and 70s, farm-to-table began as a revolt against the processed food empire that had built during the early 20th century. Food preservation techniques such as canning had helped to build an industry based on producing long-lasting foods, which were also often more inexpensive to make. While the longevity and price of processed food made it a profitable business, the nutritional value and quality of mass-produced products left something to be desired. By the 1960s and 70s, the larger hippie movement (whose members focused on being counter-culture in an effort to free themselves from societal constraints) was pushing against processed products, favoring local and organic foodstuffs above mass-produced staples. This preference for fresher foods soon began influencing the larger food industry. As a result, chef and restauranteur Alice Waters opened Chez Panisse in Berkeley, California in 1971, the first farm-to-table restaurant. Although farm-to-table can be traced as far back as Waters and the mid-20th century, the explosion of the movement didn’t come until the early 2000s. Farmers’ markets and farm-to-fork restaurants quickly began popping up across the country in the early 21st century, with restaurants like The Herbfarm in Seattle, or The Kitchen in Boulder, Colorado building large followings. Today, farm-to-table restaurants and farmers’ markets can be found in almost every major city nationwide. The growth of the movement has been largely attributed to the work of food activists, who vigorously promote the benefits of eating locally grown food. The advantages espoused by supporters of local food have not always been well-received however, and the movement has also received a good deal of criticism in the past two decades, making it one of the largest current debates in the food industry. Chokecherry soup. 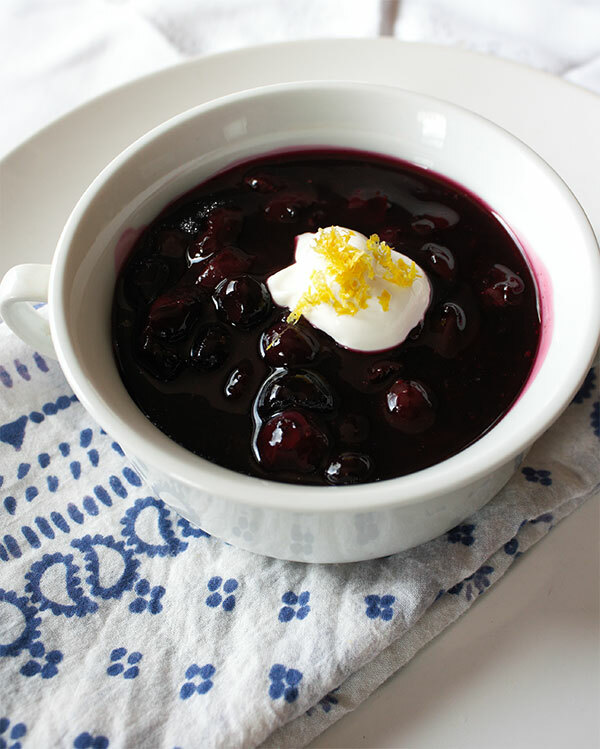 Chokecherries are native to Montana, where chokecherry soup is a popular local dish. Reprinted from The Big Sky Bounty Cookbook: Local Ingredients and Rustic Recipes by Chef Barrie Boulds and Jean Petersen, courtesy of Chef Barrie Boulds (pg. 59, The History Press, 2018). A Diverse Local Economy: Proponents often claim that local eating helps to diversify a local economy. By choosing food that’s grown locally, consumers help to keep their money within their own community, rather than forwarding it to a national conglomerate. This not only helps local farmers competing with national producers, but also might help the local economy, as that same money can be reinvested in other local businesses later on. Growing the Community: One of the central elements of the farm-to-table movement is the strengthening of communal ties. Supporters of the movement believe that events like farmers’ markets are a great way for local communities to get together and celebrate their area. These personal connections can be beneficial for both farmers and their customer, as they help to not only build regional pride, but also help build relationships between farmers and the people they serve. Indian tacos served on fry bread. Reprinted from The Big Sky Bounty Cookbook: Local Ingredients and Rustic Recipes by Chef Barrie Boulds and Jean Petersen, courtesy of Chef Barrie Boulds (pg. 79. The History Press, 2018). Better Tasting, More Nutritious Food: Farm-to-table advocates also claim that local food will taste better than preservative-filled food that is shipped long distances. Recent studies have found that foodstuffs can be transported up to 1500 miles on average before reaching a customer’s hands. To be sure this food is fresh once it reaches a grocery store, it will often be picked from the vine before it is ripe, and allowed to ripen during transportation. As a result of this practice, produce will lose some of its nutritional value. By buying directly from farmers, local food advocates argue that consumers will receive a product that was allowed to ripen on the vine during its intended season, which will not only be more nutritious, but also taste better than food grown out of season and then transported. Helping the Environment: As a result of not shipping food over long distances, local eating activists say that farm-to-table practices can also benefit the environment. By reducing greenhouse gas emissions from transportation, local eating can have worldwide benefits, as food is often shipped worldwide. Local eating would help to offset the environmental impacts of massive global food shipments, as countries would not be trading as many products internationally. Less Food Choices and Variety: Critics often point out that eating local means committing to only eating foods that naturally grow in someone’s region, meaning some food staples must be given up depending on season. While it might be enjoyable to have apples year-round in New York State, apple season only lasts a couple of months during the fall, leaving the rest of the year to wait for a new harvest. In areas like the Midwest, common kitchen spices like cinnamon cannot be grown during any season, eliminating the ability to have spices for completely local dishes. As a result, true farm-to-table diets can be difficult in the modern day, where societies have become accustomed to products from other areas. The Question of Health: While proponents cite the health benefits to eating locally grown foods, detractors question whether local food is inherently healthier. While food grown in small, local farms might be organic or GMO-free depending on government regulations, there is no true guarantee that crops are raised without pesticides, or without some genetic modification. As a result, critics argue the notion that local food must be healthy is a largely popularized myth. 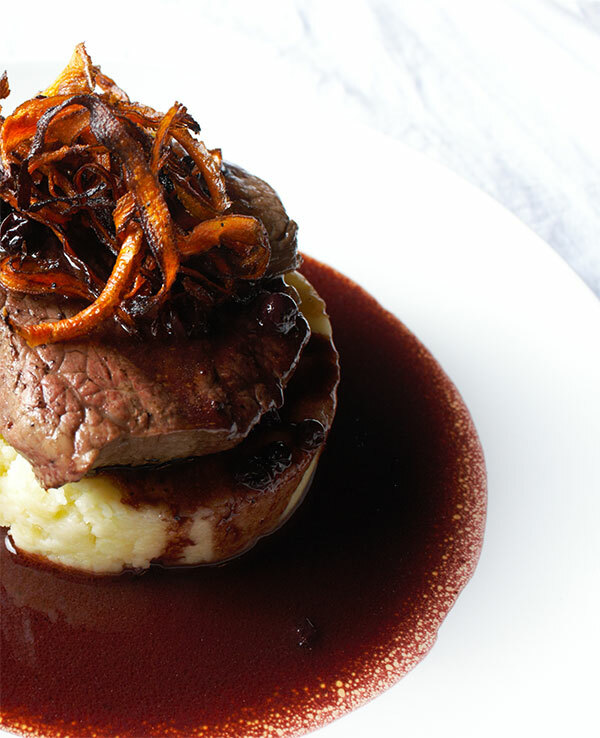 Elk tenderloin with huckleberry demi-glace – elk is native to the Montana area, as are huckleberries. Reprinted from The Big Sky Bounty Cookbook: Local Ingredients and Rustic Recipes by Chef Barrie Boulds and Jean Petersen, courtesy of Chef Barrie Boulds (pg. 109, The History Press, 2018). Food Safety Concerns: One of the largest criticisms continually waged at locally grown foods concerns said food’s safety. Smaller farms, according to detractors, are often less regulated by the government than large-scale agricultural operations. As a result, the safety of this food is questionable at best. Supporting these claims, critics site examples such as Mexican food chain Chipotle, who, while attempting to ride the farm-to-table movement wave by sourcing their products from local sources, has struggled with outbreaks of diseases like E. coli, norovirus, and salmonella with their products. Consequently, critics claim that the trust that farm-to-table requires in suppliers could be misplaced. Global Hunger: While local food may be beneficial for nature overall, local food opponents argue that it may not be viable for all environments. In climates such as the arctic or desert areas, farming can be difficult, and harvests may not reap enough food to feed a community. In addition, in urban areas, farmland is often taken to make space for population growth, leaving less real estate for small farms near these metropolises. With the global population expected to hit 9 billion people by 2050, industrial farming may be a necessity to keep the world fed. 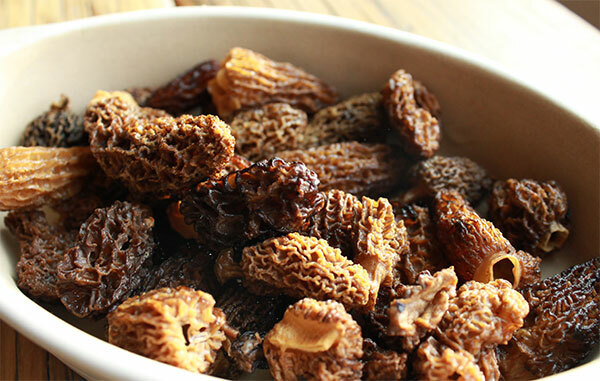 Morel mushrooms, an expensive staple of local Montana eating. Reprinted from The Big Sky Bounty Cookbook: Local Ingredients and Rustic Recipes by Chef Barrie Boulds and Jean Petersen, courtesy of Chef Barrie Boulds (pg. 42, The History Press, 2018). Like any debate, farm-to-table presents both advantages and disadvantages for consumers to contemplate. For those concerned with helping the environment and building a strong local community, eating local presents a good opportunity to accomplish both goals, all while promoting healthy eating. However, local eating may not always be a feasible option for those in more remote or urban areas, where locally grown foods can be harder to come by. In these cases, traditional industrial farming may afford the opportunity for not only a more varied food choice, but also provide enough products to keep a population from going hungry. Whether you’re for local eating, against it, or somewhere in between, be sure to get the best local recipes from The Big Sky Bounty Cookbook! How important do you think local eating is in 2018? Let us know in the comments below!